This is a simple guide for how to build and run Wayland & Weston on a Raspberry Pi. Progress in the VC4 graphics camp and the Wayland camp now enables us to run Weston on top of the drm backend for VC4 platforms. Previously software acceleration using pixman was needed, but this is no longer the case. Additionally the rpi backend for weston is now being removed since it has been obsoleted by the improved drm layer. Let's explore running hardware accelerated Weston on the Raspberry Pi. A comprehensive guide for building a recent Linux kernel for Raspberry Pi boards has been written by the Raspberry Pi foundation and is available here. As of this writing the guide helps you build a v4.4 kernel which is good enough for our purposes. These build instructions are based on the Wayland instructions from freedesktop.org, but altered to target VC4 and Raspbian. You probably don't want to install experimental builds of software among the usual software of your operating system, so let's define a prefix for where to install our builds. Start by installing the build dependencies of mesa, weston and wayland. The above step can alternatively be completed using the GUI of your package manager, by enabling source packages. Configure and compile mesa with vc4, wayland and EGL support. Weston and Wayland have a number of dependencies that also need to be fetched and built. Weston is a Wayland compositor, so we're going to have to build Wayland. libinput is a dependency of Weston, handles input devices like keyboards, touchpads and mice. Finally we've built all of the dependencies of Weston and can now build it. That wasn't so bad, it took a little while, but now we're ready to start Weston. 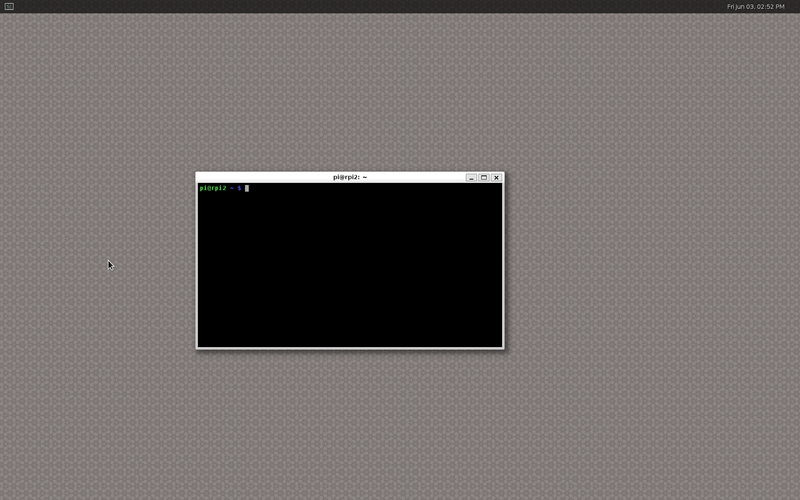 Now, let's fire up a (virtual) terminal. Make sure that you're not running an X terminal, ssh terminal or serial terminal. Running weston in this way depends on logind. # Make sure that $DISPLAY is unset. # And that $XDG_RUNTIME_DIR has been set and created. Now that we're running weston, let's try some applications. They're located in the top level directory of weston. When you've started all of your favorite applications you can grab a screenshot by pressing Super + s, which will save wayland-screenshot.png in your home directory.